What is Double Delight/Hat-Trick Heaven? Double delight/hat-trick heaven, or “DDHH”, is an excellent offer with lots of expected value (EV) and profit potential. This guide shows how to profit from DDHH using matched betting techniques. DDHH is available on selected football matches each week with Betfred and Totesport. Other bookmakers may offer variants of DDHH with their own specific terms. Basically, you place a first goalscorer bet at Betfred in the “first goalscorer” market for that particular football match. Then place a lay bet on your player in the “first goalscorer” market at the exchange. If your player scores the first goal of the match, then scores another goal, the bookmaker will payout at double the odds. If your player scores a hat-trick, you get paid out at treble odds. This offer has an excellent long-term profit potential, but there will be qualifying losses until DDHH triggers. Therefore, you must have patience and a long-term mindset. This is not an offer for beginner matched bettors. You need a solid bankroll in place to handle the variance. Simply place a first goalscorer bet on one of the selected matches. Look for a close odds match. The benchmark is up to 20% qualifying loss of your total stake. Sticking to a maximum 20% qualifying loss is considered positive expected value (EV+), i.e. you would expect to make a profit over the long-term. For example, on a £25 stake your qualifying loss should not exceed £5. As a benchmark, ideally you want within one point between back and lay odds, such as 4.00/4.60, 5.50/6.00. Backing £25 on a 5.50/6.00 shot, the back bet would return £112.50 if your selection scores first. Therefore, lay £22.50 at 6.0 odds at Smarkets for a liability of £112.50. 1. If your player does not score first you’ve made a £3.00 qualifying loss, including the £2.50 loss and £0.50 Smarkets commission on your winning lay bet. 2. If your player scores first but doesn’t score again you’ve made no loss, since the £112.50 winning bet is cancelled out by your losing lay bet. 3. If your player scores first and then scores second, you’ve made £112.50 profit. If your player completes the hat-trick, the total profit is £225. This DDHH method is EV+, if not risk-free. You will inevitably incur qualifying losses until DDHH triggers. However, this offer is mathematically sound over the long-term if you stick to good odds matches. There is no minimum or maximum stake for DDHH, but Betfred pay out bonus winnings up to £6,000 per match. Preparation: Make a list of which matches qualify for DDHH each week, then check the odds 1 hour before kick off time. The lay odds often drop at the exchange in the hour before kick-off. Use shops: Use Betfred betting shops to place your DDHH bets, as they are slow to cut the first goalscorer odds. Placing bets in shops instead of online is also good for your online account health. Underlay: Consider laying slightly less than a standard lay at the exchange. Then if your player scores first, but doesn’t score a second goal – your qualifying loss is reduced. Don’t chase the profit: Stick to the 20% qualifying loss benchmark for each bet. Do not alter your strategy just because you think a particular player might score lots of goals. The likelihood of a player being the first goalscorer is already priced in to the odds. Cover the second goalscorer: You can combine Betfred DDHH with Dafabet second goalscorer promotion. For the Dafabet offer, simply back and lay your first goalscorer selection as normal (for a £1 to £50 stake). This covers the eventuality of your selection scoring second instead of first. Samuel Eto’o scored a hat-trick for Chelsea against Man Utd in January 2014. Eto’o was available as an 9.00/9.20 near arb at the time! Harry Kane scored a hat-trick for Tottenham versus Burnley in December 2017. Betfred paid out at 27/4 (6.75) from the original odds of 9/4 (3.25). 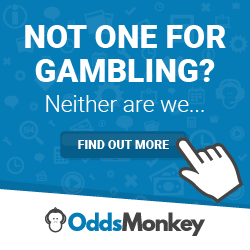 In summary, DDHH is not a risk free matched betting offer. However, it is worth taking a close odds match for a chance at a bumper payout.